Ultra Patios is the premier provider of custom-built Alumawood patio covers in Las Vegas. The brutal summer weather in Las Vegas requires residents to seek protection from extreme heat in the form of patio covers. Create a safe, shady and comfortable outdoor area where you can entertain family and friends under your new Alumawood patio cover. Alumawood patio covers are an efficient method for expanding your outdoor space while protecting your guests from the harsh elements. Let Ultra Patios help you create an area that perfectly blends style and comfort with the use of several design and style options available to accommodate your specific needs. Simply put, Alumawood patio covers are patio covers made of aluminum. Alumawood shade structures possess an embossed surface designed to resemble the texture of a wood grain finish. Due to its construction material, our patio covers require less maintenance and upkeep than traditional wooden products and won’t crack, peel, or rot. 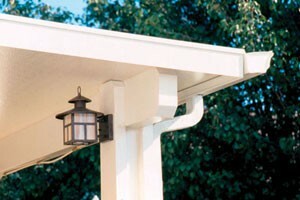 Our Alumawood patio covers are available in two different product lines designed to parallel your stylistic preference. The Laguna Lattice option adds an elegant feel and charming energy to any exterior space. The Laguna Lattice style provides the flexibility of reducing sun exposure by 40 to 60% without restricting pleasant breezes. The second option is the Newport Solid Roof structure. The Newport Solid Roof provides maximum protection from the sun’s harmful rays as well as rain that would normally cut short an outdoor event. Spend your time enjoying your patio — not taking care of it. Alumawood patio covers are entirely weather resistant, require minimal maintenance and are proven to stand the test of time. Depending on which style you choose, your patio cover can either allow variable amounts of sunlight to enter the patio space, or it can provide the ultimate shade structure to bring maximum UV protection. Our products do not fade and come standard with a manufacturer’s limited lifetime warranty. Our work is guaranteed, constructed with heavy beams and steel, and is rated to withstand wind gusts up to 115 mph. Alumawood patio covers come complete with a textured wood finish and are available in seven different colors and multiple styles. When you work with Ultra Patios, you can expect nothing less than expert craftsmanship. We put our 35 years of experience to work for every Alumawood patio cover that we install. We love to assist with design and style options. Call today to schedule your free in-home estimate and join our extensive list of satisfied residential customers.